Even today, media in the arts are more likely to be perceived by means of the design of technical devises than their function as catalysts of interaction. At the same time, the coding of information is, even at the highest levels of technologies (CD-Rom, Internet), simple to decipher: 0/1, on/off. The binary is a magical and monotone rhythm, lacking syncopation. The light installations of Fritz Balthaus abide by the same rules. 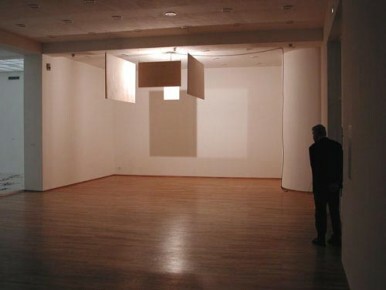 A 2000-watt bulb floods the gallery with light. A complex stabile/mobile made of mirrors and wooden panels casts supremacist rectangles on the walls. With this simple intervention Balthaus comments on those media which essentially generate images of images. Here authenticity is not a question of perception but rather grounded in experience. The gray shadowed areas are likewise reflected in mirrors and overexposed, white areas are designated as art production, since the historical reference is focused or rather represented by them. Malevich meets Marcel Duchamp. One sees that which one remembers, albeit in the moment of fresh illumination. The mythos of pure enlightenment and its envelopment in representation goes hand in hand with the reductions of classical modernism; the “victory over the sun” which Malevich propagandized in the October Revolution concerned the technical projections (stage, film) of the times, “but not without engaging those who use them”, as Gerhard Wild remarked in his catalogue essay on Balthaus’ exhibit in Schloß Solitude Stuttgart. However, the light installations of Balthaus do not function as metaphors for an operating system which stylizes information into minimal art. The “picture” on the wall is as much a product of energy as a field for transmitting it. In Germany electricity flows predominantly on alternating current, causing flicker on the edges of the projections - which from the side of science could indicate a hidden meaning – but is merely a result of the differing voltages of the warm light bulbs. Transferred to the discourse on new media, in Fritz Balthaus’ work the object of representation always exists as a trace in which the ratio 0/1 becomes clair/obscure. As such, these Balthaus images have their roots in Walter Benjamin, who wrote in his essay “Artwork…” that aura could be defined as the unique appearance of distance, “however close it may be. In the trace we take possession of the object, in aura it takes possession of us”. In Balthaus’ work the medium itself takes on the appearance of an image. Fiat lux logis.